ANYONE expecting someone as politically-astute as Tracy Chapman to take full advantage of what she described as “these sensitive times” was proved wrong. With plenty of edgy protest anthems in her songbook to scrutinise world affairs, Chapman could have had a field day in front of a near sell-out crowd. But the Carling Apollo gave her a rousing reception that suggested she could do little wrong, whatever her choice. The atmosphere dripped with a warmth that made the occasion seem more like a religious pilgrimage than mere fan adulation. Still, amid the excitement, we got what we had come to hear – Chapman’s powerfully distinctive voice for 90 minutes, demonstrating why she remains a force to be reckoned with. Characteristically casual in denim and boots, the multi-Grammy award winner from Cleveland, Ohio looked as if she’d be just as comfortable back in the coffee houses and nightclubs where she started. Chapman’s thoughtful brand of mostly guitar-led ballads began a tad nervously, but proceeded with the delivery of a crowd-pleasing master class. There is also a more bluesy element to her these days that sits surprisingly well with the cool harmonies and thought-provoking lyrics. 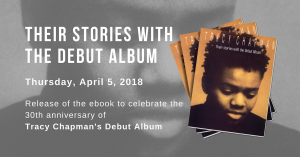 Feeding off the jovial vibes, she let us have Let It Rain, the title track of her latest album, pretty early before easing into her stride with songs from her brilliant 1988 debut album, Tracy Chapman. Every artist has a track so crafted it is only right when in their hands, so to hear her do Fast Car and Talkin’ Bout A Revolution serves to remind you of her touchingly incisive and evocative songwriting. To close, she succumbed to her political conscience with an impassioned rendition of Bob Marley’s, Get Up, Stand Up – a personal rallying call she garnished with power and dignity. TRACY Chapman’s rise to worldwide fame was pretty mercurial even by the standards of these Pop Idol days. On the morning of June 11, 1988, despite having had her debut album released two months earlier and playing a handful of live dates around the UK, the 24-year-old, Cleveland-born folk-protest singer was, for all intents and purposes, a complete unknown. Then she secured a way-down-the-bill slot on the concert being held at Wembley to celebrate the seventieth birthday of the still-imprisoned Nelson Mandela. The show was televised worldwide and her few minutes on stage turned her into a star. The album, just called Tracy Chapman, sold 12,000 copies in a day and continued to sell so fast that a couple of weeks later it was at the top of the album charts. A few weeks later, it pulled off a similar stunt in America. That September she joined a star-studded line-up of Bruce Springsteen, Sting, Youssou N’Dour and Peter Gabriel on the Human Rights Now! World Tour for Amnesty International, playing the stadia of the world for six weeks. Fifteen years later, with new album, Let It Rain, picking up very favourable reviews, she’s still somebody who maintains that her strategy for getting her songs heard is simple. “I’m just putting it out there. I don’t think it’s helpful to try to figure that out,” she says. Nor is she that much more forthcoming on the pleasures, or otherwise, of performing those songs live, which is what she’ll be doing in front of a sold-out Manchester Apollo. As you might gather, she’s a very private person and the less-than-tender attentions of the press appeal to her just about as much as the grotesque “reality” TV that currently mars our screens. Words fail her at this point, but they never do in her songs and that’s really where Tracy Chapman does her talking. Tracy Chapman is at the Manchester Apollo, Ardwick Green, on Saturday, March 15. Contact the venue to confirm ticket availability. Cheryl George, 03/20/03: This was the second time that my friend and I were attending Tracy’s concert in less than a week. We knew what to expect and were all the more excited for it. Tracy seemed more relaxed than she was in London-she had received such a rapturous reception to her performance at the Albert Hall that she knew that her songs and her voice had not lost their appeal to us. Those of the audience who buy into the “serious and dour” image that is attributed to Tracy were seriously challenged: she giggled in genuine delight at our response to her songs, teased her band and chatted with the audience. Tracy is the only artist I know who sounds so much better live than she does in her recorded material. And the fewer instruments accompanying her the better. Her voice works on several levels and seems to contain its own accompanying instrumentation. (her rendition of “Behind the wall” made me come out in goose-bumps). Tracy is still reluctant to engage in a lot of chit-chat during her show and some fans find this very frustrating. I share some of that frustration, as I enjoy listening to her views on life and her explanation of her songs. However, on balance I appreciate the fact that during her concerts she spends maximum time speaking to us through her songs. Her voice has the power to soothe my spirit and her words have the power to inspire my soul. I was aware that I wouldn’t be enjoying this live experience again for a few years so savoured every note.